Are you trying to adopt agile methods into your organization? Are you facing significant resistance from your teams or business management? Don't try to find your own way -- learn from those who have gone before you and take the easy road to agile adoption. 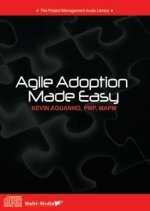 In this live recording of a one-hour seminar on agile adoption, agile project management expert Kevin Aguanno shows you how to slowly phase in agile techniques into your organization and make them appear as if they are compatible with your current processes. In this recording, he advocates not pulling in a whole new methodology in one massive change, but rather adopting specific agile techniques, one-by-one to into your projects until the team members and stakeholders are using agile methods without realizing it. He suggests specific agile techniques that you should phase in early in your transformation, and how to "package" them to avoid objections from the business stakeholders. Full of real-life stories, he brings the subject to life and turns abstract concepts into practical next steps.